So when I first decided to adopt a pinup lifestyle, I knew I had to find new places to shop! 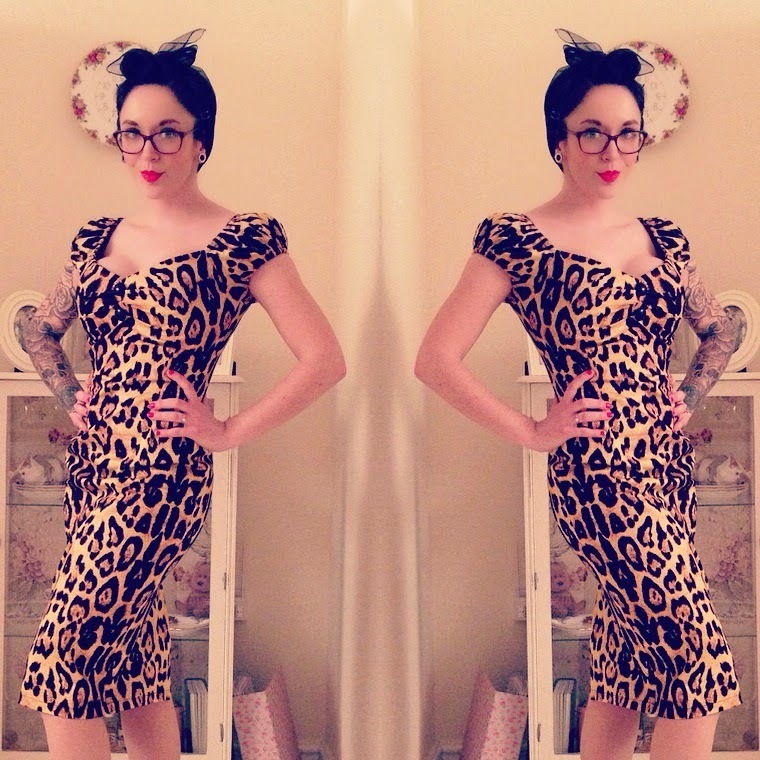 Shops that specialise in pinup fashion are few and far between on the highstreet, unless you live in London and the big cities, so I hit the world wide web and started to put together a directory of pinup fashion retailers. I have also added pound signs (£) which indicate, on a scale of 1-5, how expensive these shops are (5 £'s being the most expensive), to help those on different budgets. I will also be adding any discount codes which these retailers currently have available. I have only scratched the surface of this list, but I really want to try them all! I really hope that this list is helpful to girls starting their pinup journey. Collectif is one of my favourite places to shop for reproduction 40's and 50's clothes and accessories. They have a huge range of pinup basics and occasion wear; 90% of my pinup wardrobe to date has come from Collectif. Their huge variety of separates mean that you can easily mix and match clothes from their entire range. In my opinion, their sizes come up a little small, but I am finding that this is pretty standard across pinup retailers. They are not the cheapest place to shop, but you get what you pay for. 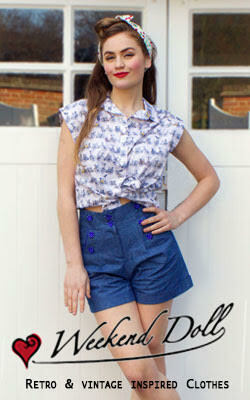 Every item that I have brought from Collectif has been of a superb quality. For those of you on a budget, Collectif do amazing sales, so add a Wishlist and wait for those Discount Codes! 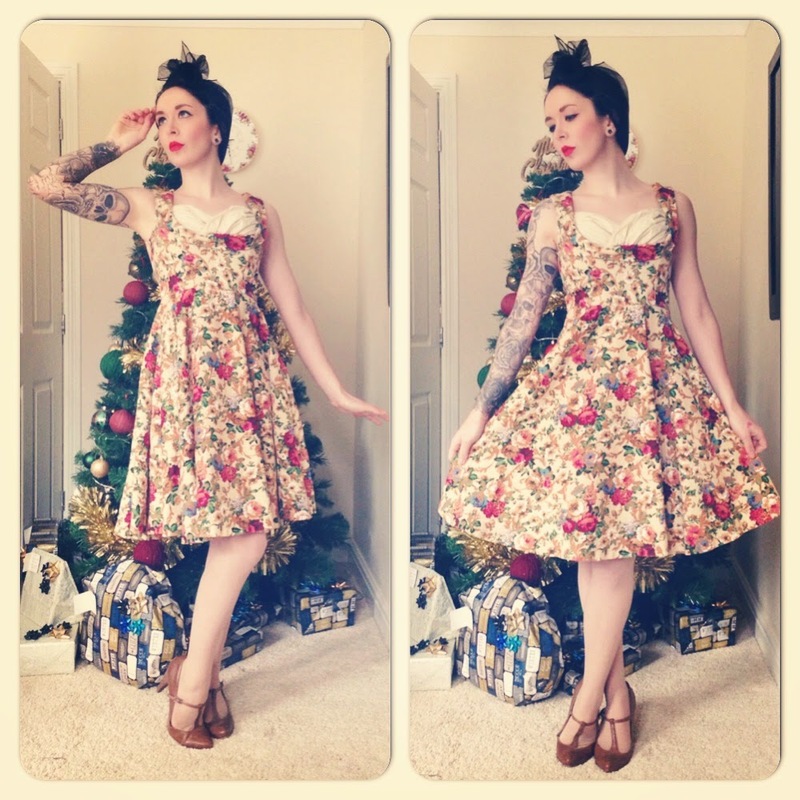 Collectif Christmas Sale Discount Code: FESTIVE50. 50% off everything, excluding Accessories, Sample Sale, Gift Vouchers and the Pearl Coat. 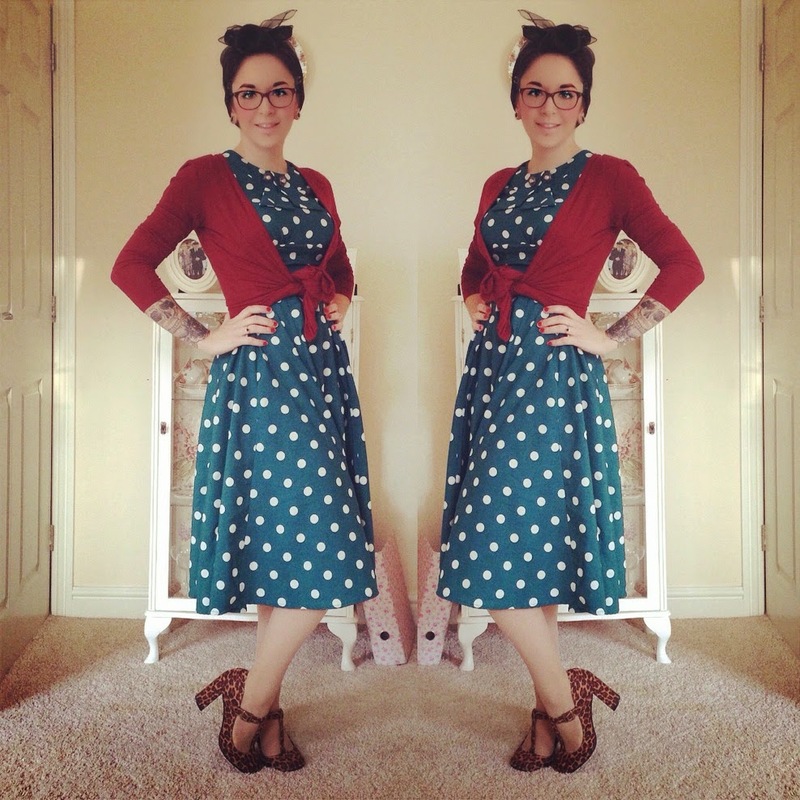 Vivien of Holloway specialise in repro 40's and 50's fashion. The have an amazing range of 40's swing trousers and other basics, as well as beautiful dresses in a range of authentic styles and shapes. If you are looking to add to your pin up wardrobe and you are on a bit of a tight budget, then Lindy Bop is the place to shop. They sell a huge range of gorgeous dresses, many under £30. Their clothes are vintage inspired from the 40's, 50's and 60's. Their 'Ophelia' dress is possibly one of the nicest dresses that I own. Its beautifully made and at only £34.99, it's an absolute bargain. 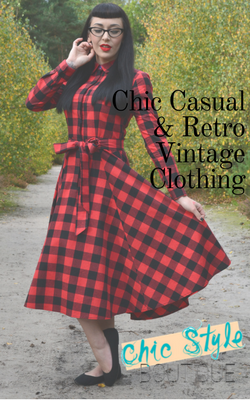 20th Century Foxy sell vintage clothing from a range of eras, including the 1930's, 1940's, 1950's and 1960's. They are a little more on the expensive side, but if you are looking for a show stopping dress for that special occasion, in which the only way you can arrive is looking like a movie star, then 20th Century Foxy is the place to shop. Not only does this website sell beautifully authentic reproduction vintage from 1940's patterns and designs, the website plays Glenn Miller when you arrive! What more could you want! Their Look Book contains a small selection of beautiful pieces which would provide the basis of any essential 1940's wardrobe. Soho's specialise in a wide range of alternative clothing, including brands such as Hell Bunny, Banned, and Voodoo Vixen.They also sell accessories, shoes and gifts. Formerly known as Vanity Project by Limb, Victory Parade Clothing, sell beautiful 40's and 50's inspired dresses, with a nod to Hawaiian, Mexicana and Asian Pacific fashions. Miss Bamboo is a really fun website, selling items which are prefect for your Summer wardrobe. The website is broken down into four main styles - Americana, Hawaiian & Tropical, Mexicana & Latino and Asian Pacific. They also sell Miss L Fire shoes, handbags and accessories. I intend to buy a lot of items from this website in anticipation of my Honeymoon in Hawaii next year! For those of you who want to take your vintage outfit to the next level, What Katie Did sell vintage inspired lingerie from the 40's and 50's, including the iconic 'bullet bra'. They have a concession in the Collectif Old Spitalfields Market shop in London. Revival Retro sell reproduction clothing and shoes from the 20's, 30's and 40's. They feature absolutely stunning 'Gatsby' inspired 1920's dresses, as well as beautifully made basics from the 40's, such as shirts and cardigans. Pair these with your 1940's swing pants from Vivien of Holloway and you are onto a winner! Bow & Crossbones sell a lovely range of 1950's inspired accessories, clothing, jewellery and home wares. To date, they are the only place online (that I have found) that sell coloured chiffon head scarfs! They sell them in a rainbow of colours, at only £3.50 each! Lady Luck's Boutique sell accessories which are perfect for any beginner pinup. For example, they sell an 'Ultimate Tiki Accessories Kit' which enables you to add instant tiki style to any outfit.They also sell a range of Bettie Page shoes to finish off your pinup outfit. Tiger Milly sell reproduction 50's fashion, shoes and accessories. They stock well known brands such as Hell Bunny, Lindy Bop, Voodoo Vixen, Collectif, Banned, Ruby Shoo and The Seamstress of Bloomsbury to name a few. It's your one stop shop for vintage fashion. Daisy Dapper are based in Stockholm, yet don't let that put you off. They sell the most amazing 40's and 50's inspired clothing, shoes, bags and accessories. Dovima is not like your average vintage repro store. This design house creates items inspired by the golden era of glamour and sell items which are reserved for only the most special of occasions. There is nothing too flashy about these designs; they are simply, pure class. Born Bad Betty sell a range of Day, Swing and Wiggle dresses, as well as a range of shoes and accessories. Emmy are based in Sweden and sell the most beautiful vintage inspired items. The jazzy 30's, the classy 40's, the rock 'n' roll 50's or the swinging 60's. Whatever you are into, they have something to make you feel absolutely fabulous! Pin Up Girl Clothing is THE name in vintage reproduction fashion in America. Worn by published pinup models in the US and the UK alike, this clothing brand has everything to make you feel like an absolute superstar, day and night. We are stopping off in California on the way to Hawaii for our Honeymoon next year and a trip to the Pin Up Girl Boutique is on the list of things that we must do! I hope this post has been helpful. I will continue to add to it as I go, but if there are shops and retailers that I have forgotten or you think should be on the list, please feel free to comment!